Starting around 300 AD the Indo-Europeans in Central Asia began to lose ground to the Altaic people. The Altaic people divided into the Mongols and the Turks. One mixed group of Mongols and Turks, the Rouran, formed an empire north and west of China (modern Mongolia and Uzbekistan). Their empire included a Turkic group called the White Huns. Around 400 AD, the White Huns left the Rouran Empire and headed west. They briefly conquered the eastern Persians and the Sogdians, and even northern India. By 550 AD, the Rouran themselves were conquered by another Turkic group, the Gokturks. The Gokturks also conquered the Sogdians, and also expanded west into Russia. They also raided to the south and east, into China. The Chinese tried to fight back in the 700s by supporting yet another Turkic group, the Uighurs. By the 800s, most of the Indo-Europeans of Central Asia had been squeezed out of power by Turkic groups coming from the north and Semitic Arab groups coming from the south-west. The Sogdians regained some independence as the Samanids, but then were taken over by the Turkic Ghaznavids. The Turkic Seljuks then conquered the Abbasid Empire and what was left of the Roman Empire in West Asia. By 1100 AD, Turkic people pretty much ruled all of Central Asia and West Asia. By 1500 AD, most of eastern Europe and North Africa was also under Turkic control. The Scythians were taken over by other groups. One was the Sarmatians, who were closely related to the Scythians, but others came from further away. Of these, the Ostrogoths came probably from Poland, but the Slavs, Avars, and Huns seem to have come from further east. The Huns, or Hsiung-Nu, came all the way across Asia from China, where they had been pushed out by the Han Dynasty. Then beginning in the 700s AD, the Vikings began to use the Dnieper and the Volga as trade routes to the south, and gradually cooperated with the Slavs to form the country of Russia. In the 1200s, Genghis Khan was able to unite the Mongols (from modern Mongolia) and they united all of Central Asia and beyond, from China to India to Russia and Hungary. The Mongol empire promoted trade, and created peace throughout Asia. But the Mongol empire collapsed in the early 1300s because of the plague, and Central Asia collapsed into a lot of small kingdoms. Central Asia was united again for a short time under Timur in the later 1300s. 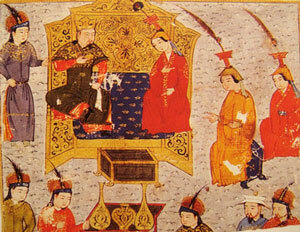 Timur was a Mongol from what is now Uzbekistan, whose family had taken up Turkish ways of life. His capital was Samarkand. Despite a disability in his leg and right hand caused by arrow wounds, Timur led his army to control Turkey, Russia, and all the way to India. But he died in 1405 on his way to conquer China. Timur’s empire collapsed after he died. Cite this page: Carr, K.E. Turks and Timur – Central Asian History. Quatr.us Study Guides, May 31, 2017. Web. April 22, 2019.